Days: September 12-20, 2015 NOTE: this event has already happened, find current-year events on the events page. Richard Steiner with the pen and frena be zero built for the BlueIndy car sharing program that just debuted September 2nd in Indianapolis. Richard just returned in June from a fact-finding and training mission to Milan Italy to the factory where the cars are being built. Then Paris France to observe the maintenance facility that maintains the cars used in Paris Autolib. Multiple EV dealers are invited and Tom Wood Nissan will have new Nissan LEAF's available for test rides and drives! Bring your EV questions and try to stump the experts. On Sunday the 13th and the 20th we will organize a drive of all plug-in vehicles that register. So register your vehicle and location you want to join the drive at. Route will be determined by registration. 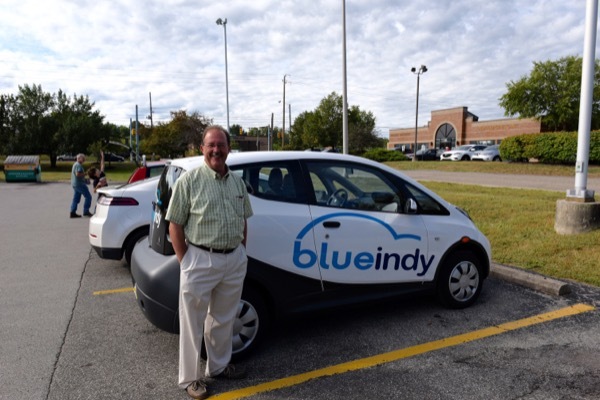 BlueIndy, (the first electric car sharing service in the USA) just had their Grand Opening Sept 2nd. To celibrate National Drive Electric Week they are extending the FREEWHEELS promotion. Just go to an Enrollment Kiosk to get a daily membership and recieve one free hour of driving! They are signing up new drivers every day; so don't miss out on a great deal! Registered attendees report 112,455 electric miles driven.